Hello lovelies and happy saturday! First of all I have to say that I'm thinking about translating all my posts to Spanish. The reason behind this thought is that this way, more of you will be able to understand everything I post. What do you think? I haven't made a decission yet so it would be nice knowing your thoughts on it. Okay let's go with today post. For me it's very important the whole skincare thing. 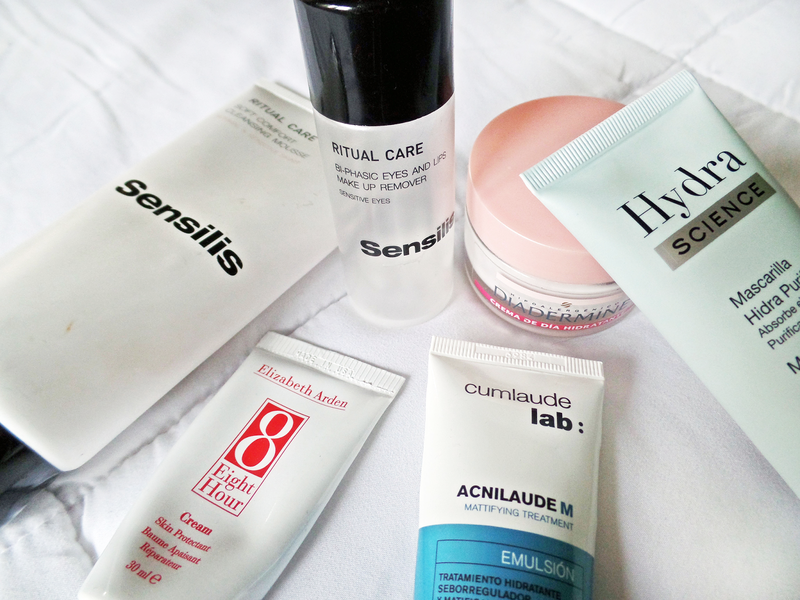 I mean, I've always been really into treating myself with face and body products so this means I have a lot of skincare products but I'm showing you only a few. Skin care is very important for me because I have a very sensitive skin and I like to take care of it.The truth is that I'm really lucky because I've never had problems with acne and I don't use to have spots. What I use to have more often are blemishes and maybe some spot in a certain week of the month but in general I feel really really lucky. But this doesn't mean I forget about my skin, totally the opposite, I take care of it everyday. DIADERMINE HYPOALLERGENIC MOISTURIZING DAY CREAM: I've been using it for years at least twice a day and it works really well on me. 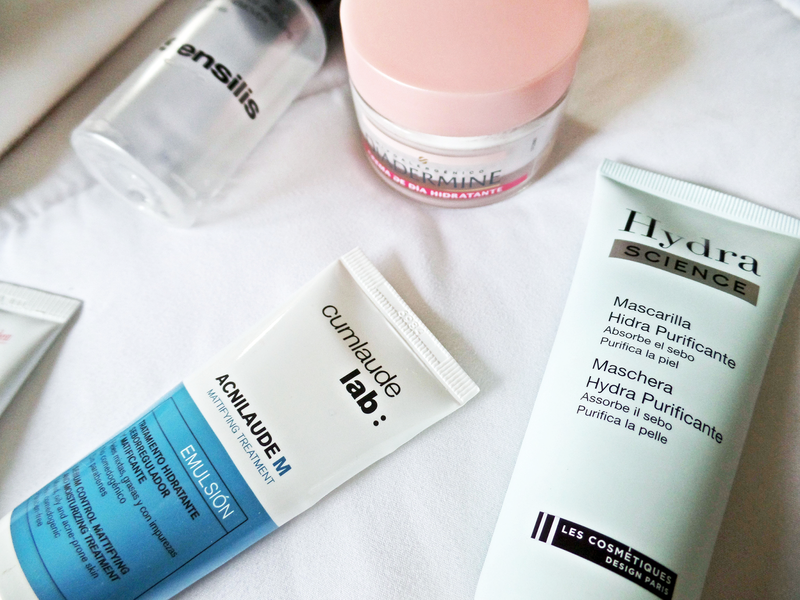 ACNILAUDE M MATTIFYING TREATMENT BY CUMLAUDE LAB: This is a sebum control mattifying and moisturizing treatment for mixed, oily and acne-prone skin. It's paraben free and I use it twice a day: in the morning and before I go to bed. I have a very oily skin specially in my T zone and this product is a-ma-zing. It takes away absolutely all the oil of my skin and it's really easy to apply. You just have to massage it into the skin until absorbed, but do not use in the eye contour area. You can also use this as a make-up base tho. SENSILIS RITUAL CARE SOFT COMFORT CLEANSING MOUSE: this is for normal and sensitive skins and it's a cleansing mouse that transforms itself into soft foam when it comes into contact with water. It has bamboo and mimosa extracts that assists in cell regeneration. It cleans the most sensitive skins and leaves a sensation of comfort and seriously, you'll feel fresh as hell after using it. I use it everyday as a make-up remover and it's also paraben-free. SENSILIS RITUAL CARE BI-PHASIC EYES AND LIPS MAKE-UP REMOVER: this is specially for sensitive eyes and easily removes eye and lip make-up, even water-resistant formulas. It's ophtalmologically tested which is really important and suitable for contact lens users. I use this along the cleansing mouse for removing my make-up. HYDRA SCIENCE PURIFYING FACE MASK BY LES COSMETIQUES: this is a hydra purifying face mask that absorbs sebum. It's for oily skins and I apply it once a week but you can use it twice. You only have to apply and left it up to 3-8 min. Then remove it with a lot of water. ELIZABETH ARDEN EIGHT HOUR CREAM: this is a skin protectant cream but I only use it in my hands cause as I said before, I have a very oily skin and since this cream is kind of oily, it's not good for my face. But works really well on my hands. 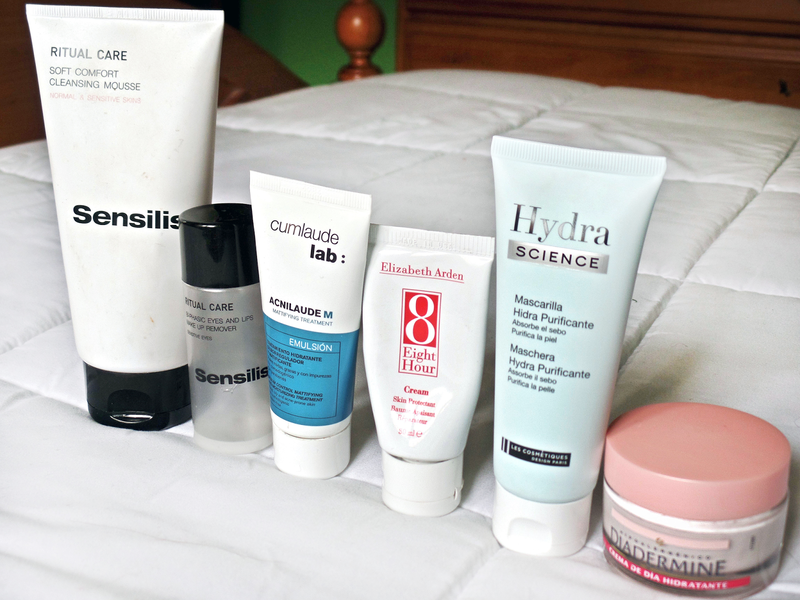 I highly recommend all the products because they work really well on me, but this fact doesn't mean that they are going to work equally in all the people who use them because each skin is different. Goodmorning. I think it is a great idea to translate your posts into your mothertongue, especially if you have enough time to do it. Great post on skincare by the way.